Part I of the book starts with the Heading “CAG NOT EVEN AN ACCOUNTANT” narrating why it is so from my own experience during my brief initial stay in the account side of the Department. From the 2nd chapter onward I am unfurling my experiences in the audit side of the Department in support of the title of the book,... Thereafter I am narrating from my own experience as to how the CAG manipulates the Audit Report with false information by hiding the real facts. From chapter 6 to 10 I am narrating how I was harassed by the administration for fighting against corruption while I was in service. In part III I narrated how I started applying the tools under the ‘RIGHT TO INFORMATION ACT 2005’ to expose the corruption and scams that too while in service. Thereafter I took voluntary retirement with the main aim to publish this book. The book is ending with, “Is it not both CAG and the Ministry is fooling the Parliament and thus the people of India?... ”. 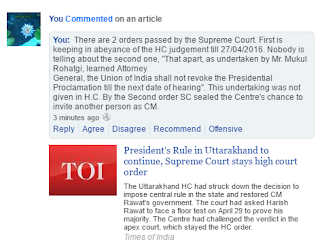 By this judgement of the division bench of Uttarakhand High Court comprising Chief Justice KM Joseph and Justice VK Bisht, more than legal issues and reinstating the government, confirmed that whether Congress Government or BJP Government, both are two sides of the same coin. Both are doing the same thing as well as opposing the same thing when the other party is in power. Also both are capitalists, stand for the rich at the cost of the poor, though the Indian Constitution declares India is a socialist, democratic Republic. Coming to the legal issues, High Court is correct in asserting its power to review any government action. All actions of the government is either issued by the President or the Governor or under their authority. Each action of the Government is subject to the review power of the High Court or Supreme Court. There are instances of declaring even the Acts signed by the President/Governor after it was passed by the respective Legislatures were struck down by the H.C./S.C. In the instant case, the action was taken under the signature of the President under Article 356 of the Constitution of India was struck down by the High Court. This article gives power to the President to declare President’s rule subject to conditions and President is not acting on his own. Further, this declaration automatically become invalid, after two months unless further conditions such as approval of both houses of Parliament are not fulfilled. 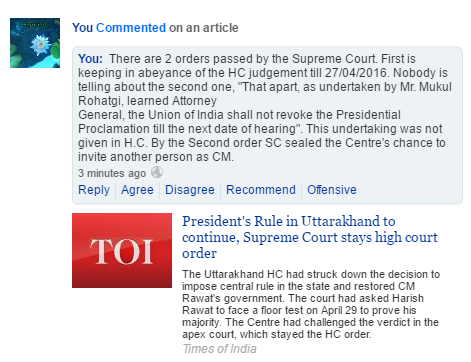 Therefore, this is equal to an ordinance passed by the President/Governor which can be questioned in the H.C./S.C. Further, the reasoning given by the High Court is also well founded, no matter what may be the outcome in case of an appeal. Therefore, the arguments put forth on behalf of the Government in defence of their action under Article 356 are not convincing. 2 जी घोटाला शुरू करने के बाद , 20 से अधिक वर्षों में , क्या सी. ए. जी. कर रहा था? NPA SCAM - A WELL PLANNED SCAM WITH THE ACTIVE KNOWLEDGE OF BANK OFFICIALS, RBI, ETC. NPA is a well-planned scam with the active knowledge of Bank officials, RBI etc. RBI conducts periodical inspection in all banks. Is it not including checking the adequacy of the security against loan? If so what they are checking while bank inspection. This is not a new issue. Even in the middle of 1990s, I pointed out many such NPA scams while I audited the Government part of the loan schemes administered by banks when I inspected the Deposit Insurance and Credit Guarantee Corporation (DICGC), a wholly owned subsidiary of the Reserve Bank of India. But all are ‘R.I.P.’ in the cupboard of CAG of India. I am nearing completion of the second part of my book, "A FRAUD IN THE INDIAN CONSTITUTION" in which a detailed account would be incorporated on the modus operandi of the scam of bad loans (NPA) thereby sucking the financial health of the country by certain people to become rich.